GLOBAL UPDATE ON CONSUMER, MARKET AND MENU INSIGHTS. Did you know that you can translate the Top 9 into any language by viewing it in Google Chrome, simply right-click the page and select ‘Translate’. If you don’t currently use Google Chrome as your web browser click here to download. Last month, Pizza Hut Ethiopia opened its first women-operated franchise, also built by a woman-owned construction company. The initiative stemmed from Pizza Hut’s aim to be a pioneer in empowering women and gender equality in the country, which recently elected its first female President. 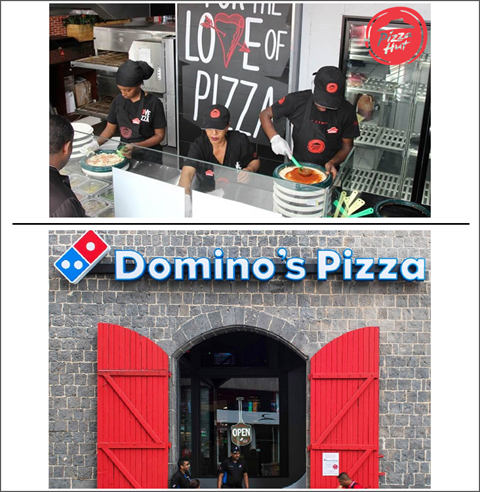 Pizza Hut became the first major international fast food franchise to set up in Ethiopia last year, in the capital Addis Ababa - click here to watch BBC clip on fast food opportunities in Ethiopia >> Another first is Domino’s first location in Dhaka, Bangladesh, with more locations planned in the year ahead. It showcases the modern theatre design with stylish interior and counter-top seating. Aldi Local is a new trial store format by the discounter - half the size of its normal store format to differentiate it from conventional-sized locations (and 3% more expensive if reports are true). 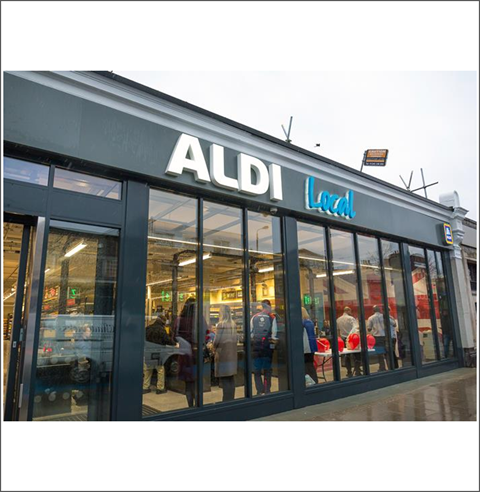 The smaller stores in city centres will stock 1,500 products as opposed to their usual 1,800 offerings – however Aldi maintains this is not to be mistaken for a move into the convenience store arena. The motivation is to provide less bulky items for urban shoppers that cannot be easily transported by car. Following in the footsteps of PizzaExpress (Za), Wagamama is also trialling its new grab-and-go brand, Mamago. The spinoff features a new tailored menu for on-the-go consumption. 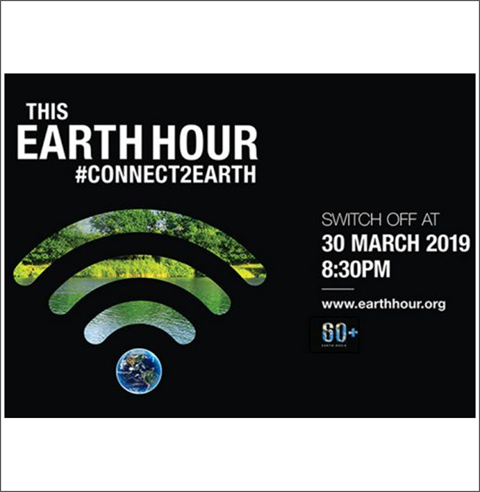 Earth Hour takes place this Saturday at 8.30pm. Millions worldwide will turn off their lights to show they care about the future of the planet. Landmarks such as Niagra Falls, Eiffel Tower, Sydney Opera House and Buckingham Palace to name a few participate in the visual display of their commitment. Consumers are increasingly considering foodservice brands’ environmental impact when choosing an eating out destination (48% consider environmental packaging for example (CGA Brand Track 2018). Casual dining chain Bill’s (80+ UK restaurants) plans to switch its lights off during Earth Hour and let guests dine by candlelight, turning it into a magical and unique experience. 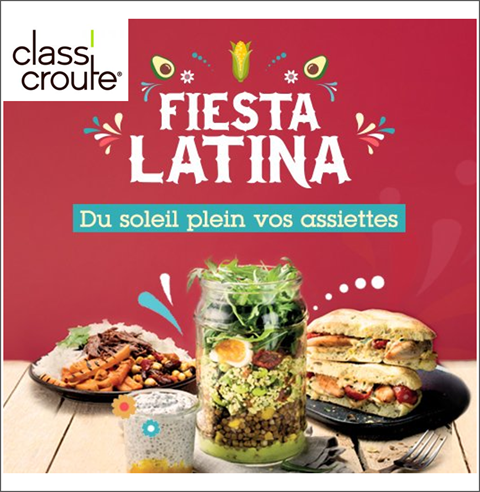 French sandwich operator, Class’Croute has launched ‘Fiesta Latina’, a new Latin American Menu featuring dishes such as ‘The Rumba’ - slow cooked Barbacoa beef with a traditional Argentinean pepper sauce (Salsa Criolla) and ‘El Tango’ a chicken sandwich with Chimichurri sauce. The new menu is part of an overall refresh to create a more contemporary fast casual image - in line with its aim to double its size within 5 years to 300 outlets (€180mn). Other growth plans include its ambition to establish itself as ‘the third space’ for flexible work meetings. Staying with France, Domino’s is embracing its American heritage with two new LTOs featuring hot dogs – click here to view >> The Cal’z Hot Dog is pizza dough filled with mozzarella, sliced hot dogs and yellow mustard. The Hot Dog Pizza comes topped with mozzarella, sausages, pickles, crispy onions and a drizzle of barbecue sauce on top. For hot dog fans, options include replacing the tomato sauce on the pizza with yellow mustard, or you can top it off it off with hot dog -stuffed crust. 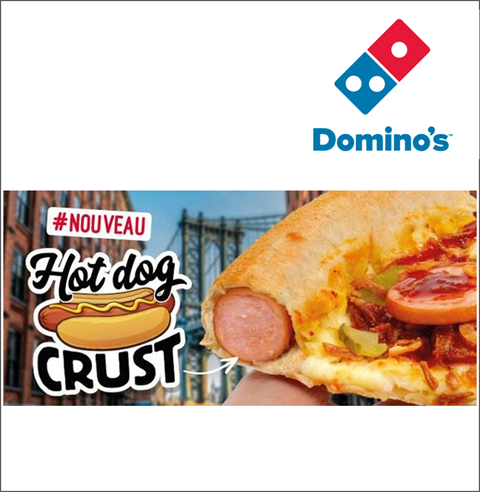 Another American pizza combination on Dominos’ France menu is the Burger Pizza, which you can also get with the hot dog stuffed crust. 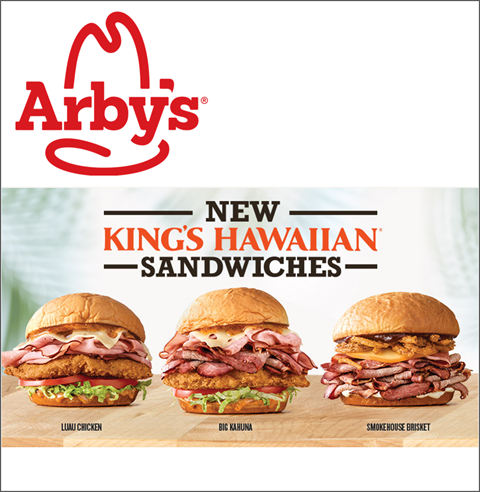 US chain Arby’s has introduced 3 new sandwiches to its King’s Hawaiian range. The King’s Hawaiian Smokehouse Brisket Sandwich features smoked beef brisket, smoked gouda, crispy onions, smoky BBQ sauce and mayo. Next is the Sweet & Spicy Luau Chicken Sandwich - crispy-fried buttermilk chicken fillet, pit- smoked ham, Swiss cheese, lettuce, tomato, and a sweet and spicy pineapple habanero mustard sauce. Lastly, the King’s Hawaiian Big Kahuna Sandwich combines all 3 meats – beef brisket, chicken fillets and pit-smoked ham. Meanwhile. over at Jimmy John’s, French baguette is the headliner with the introduction of a new value ‘Frenchie’ sandwich - salami and capicola, hand-sliced provolone and salted butter. McDonald’s is acquiring software company Dynamic Yield to create an Amazon-style personalised experience. McDonald's will use the technology to create a drive-thru menu that can be tailored to factors like the weather, current restaurant traffic and trending menu items. Once you’ve started ordering, the display can also recommend additional items based on what you’ve already chosen. (The anti-obesity watchdogs are on high alert). 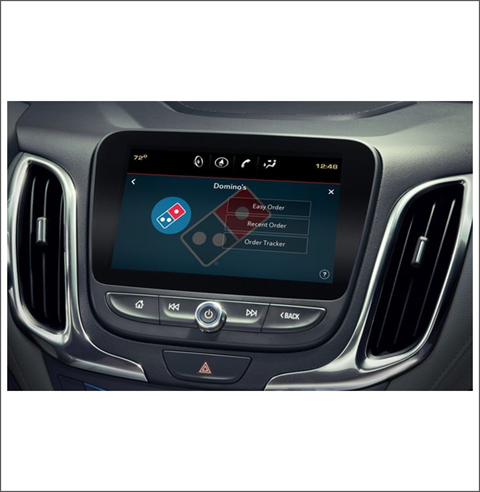 Domino’s has teamed up with Xevo, the in-vehicle commerce service for carmakers, launching the latest AnyWare pizza ordering platform to come pre-loaded in cars. The gourmet burger trend shows no sign of disappearing, even in the saturated London market. According to GBK, the beef burger’s supremacy has not been budged by any chicken or plant-based option – it makes up almost half of all orders – with Bacon & Cheese burger being the top choice. Customisation is key however – with 28% of Londoners asking for extra toppings such as bacon, extra sauces, avocado or jalapenos. 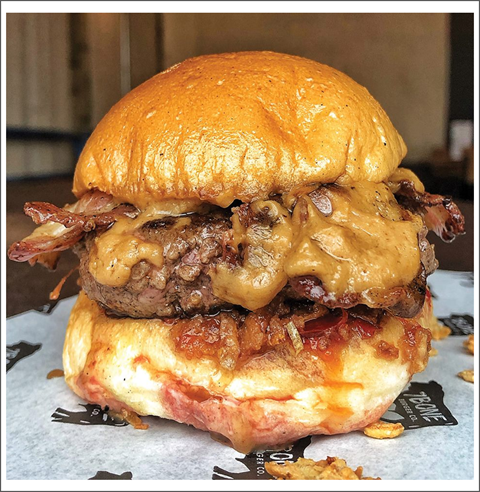 Sticking with the burger trend, an innovative and gourmet launch comes from 7 Bone Burger Co in the US – a PBBJ special, featuring a 6oz beef patty with miso peanut butter, chili jam, double bacon and crispy fried hot dog onions. 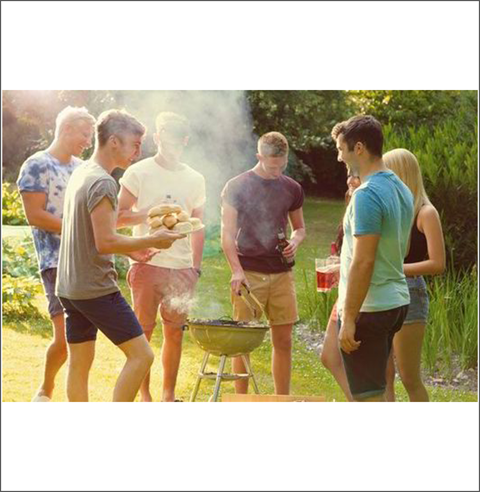 British BBQs are heating up with hotter sauces and more international flavours. Some 80% of consumers say foreign dishes make BBQs more interesting. Last year retailers were innovative in this category to capture consumers’ interest during the summer months. M&S Spirit of Summer range offered products from smoked briskets to spiced chicken tenders, while Asda and Tesco used maple, hoisin and smoked flavours in their ranges. A key trend to watch in 2019 according to the Grocer is oriental barbecue: using Japanese, Korean and Filipino cooking styles. As well as sour (Korean, Russian) expect spicy and sweet trends to still resonate - sriracha & maple, jalapeno & honey. HAVE YOU HEARD OF DAWN FARMS POCKET WATCH? Request our latest issue of Pocket Watch - a bimonthly UK consumer confidence tracker which we developed back in 2016 in response to the Brexit referendum to provide context to consumer spending behaviour in the UK. The above information has been taken from sources we believe to be reliable and trustworthy. However the accurateness and completeness thereof are not guaranteed and therefore should not be relied upon as such. Dawn Farms does not endorse or approve the content of any information from third party sites nor will it have any liability in connection with any third party site (including but not limited to liability arising out of any allegation that the content of or information on any third party site infringes any law or the rights of any person or entity). 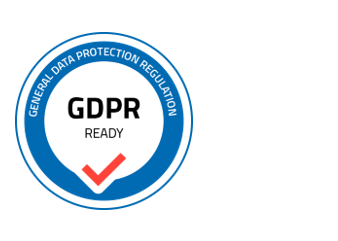 GDPR took effect Friday 25th May 2018. At Dawn Farms we take your privacy seriously. We keep your data secure and do not pass this information on to any other organisation for marketing purposes. You will always have the option to opt-out from the TOP 9 by clicking on the unsubscribe link which is located at the bottom of every issue. Many thanks for continuing to be a valued reader of the Top 9 weekly Newsletter.